Around 80 kilometres from Manado in the very northern part of Sulawesi is Tangkoko Nature Reserve. The reserve is home to some of the world’s most incredible and rarest animals, so for nature lovers or those looking for a real adventure a tour to Tangkoko is a must! If you choose to take this tour during your stay at Gangga Island Resort, the boat will leave Gangga jetty at around 11.30am and arrives 20 minutes later at Serei jetty where you will be met by an air conditioned car. On the way you’ll pass through small villages and stop for lunch at a local restaurant. If you’d rather have lunch at the resort the boat can depart from Gangga jetty at 12.30pm. It takes around 2 hours to get to Tangkoko from Serei. 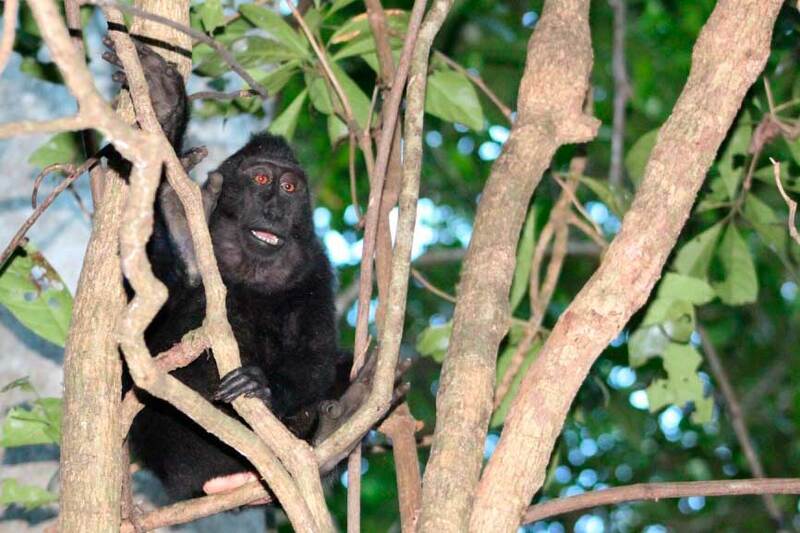 You are likely to see all kinds of primates, birds, insects and incredible flora as well. Most people come to Tangkoko with the hope of seeing tarsiers, one of the smallest known primates, but to do this you must follow the rules of the park and be informed about the best way to stay safe while in the area. First of all you should dress appropriately, wearing light, breathable clothing that dries quickly in muted colours (avoiding white and red). It is hot, and you’ll be tempted to wear as little as possible, but long trousers, and sleeves and socks and boots are advised to minimize insect bites and leeches. Although it is hot, long sleeves and pants prevent scratches and insect bites. Your guide, a local forest ranger, will ask you to go slowly and stay in small groups to make as little noise and disruption as possible. The animals are somewhat used to people walking through, but for the best chance of seeing them you’ll want to stay quiet and slow. You can also sit close to fruiting trees, pools or streams where animals are likely to gather to feed and drink. Sitting quietly can be key to seeing the wildlife in the park. You’ll find yourself surrounded by life, including butterflies, ants, beetles and hopefully some larger animals too the longer you sit. It also allows you to listen for cues from the animals sounds around you. One of your most important pieces of equipment will be a pair of good binoculars. The birds in the highest parts of the canopy will be nothing more than a colored spot without them. A waterproof bag for your binoculars and camera are also very important; it’s not called a rainforest for nothing afterall. The monkeys in the park are one of its main attractions, but be sure you know how to act while you’re around them. Don’t ever approach them, instead let them come to you. If you stoop down and avoid direct eye contact they will most likely be less inhibited around you. You’ll also be told to never feed the monkeys, and this is really important. They might seem cuddly and friendly, but they are wild animals that have been known to bite. Monkey bites can at worst carry serious diseases and at best can become badly infected. 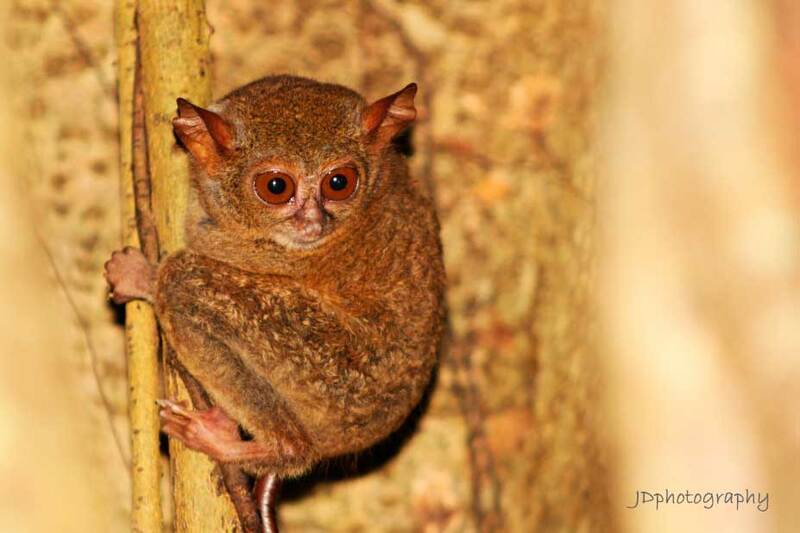 Tarsiers are often seen as the stars of the park and you may have the opportunity to go into the park at night to see these fantastic creatures. 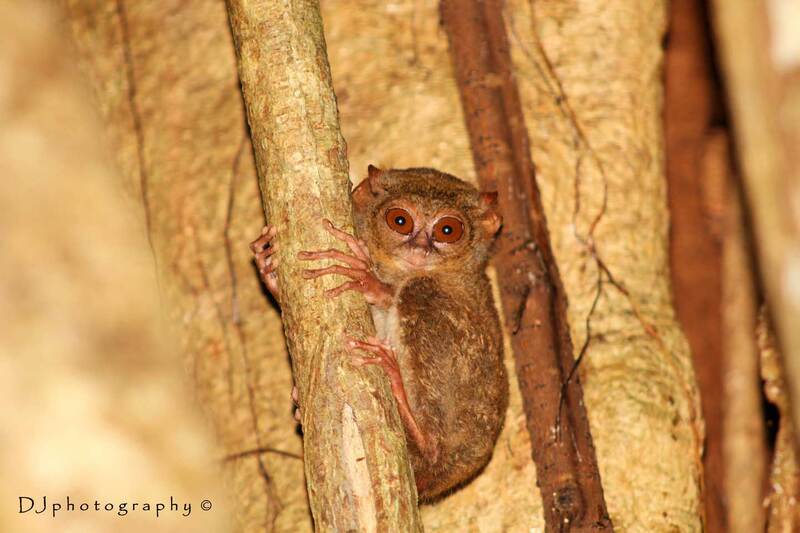 Tarsiers are very small, rarely more than 1kg in weight. They have huge eyes and can turn their heads 180 degrees like an owl, perfect for hunting at night. They also have pad like suction cups on the end of their digits to help them cling to the plants and trees they climb to find food. 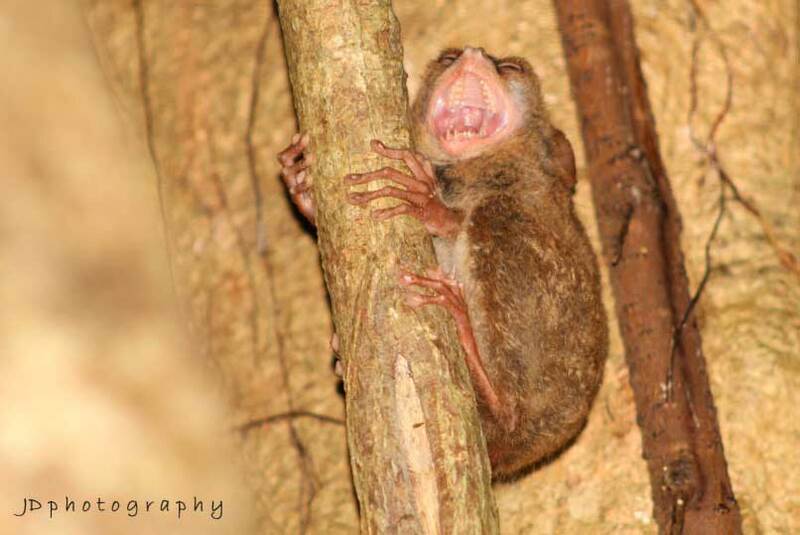 Late in the afternoon you will have the chance to head into the denser part of the jungle as the sun is setting to photograph tarsiers in their natural environment. By 5.30 or 6pm it is completely dark in the jungle and the tarsiers will be heading out to forage for the night. This means it’s time to head back to Serei pier for the boat back to Gangga. You can expect to arrive back around 8.30pm. Gangga Island Resort and Spa staff will do everything possible to ensure your stay is enjoyable and memorable.